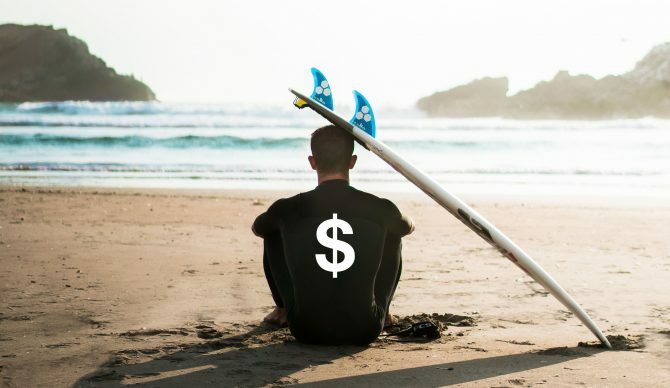 Editor’s Note: This feature is part of The Inertia‘s Money Spotlight, an initiative that explores the powerful influence of money on surf and outdoor culture. We’ll be releasing a feature each day this week with money on our minds, so check back daily. My surfing expenses have always revolved around travel. The cost of flights, rental cars, and post-surf feeds multiplies quickly. As a freelance filmmaker and writer, I figured out many years ago that I could help fund my trips by making content along the way. It’s definitely a hustle these days to get paid for your work, and it’s not always easy to pick up a camera instead of a board when the waves are good, but it’s usually worth it. In terms of destinations, I find myself going back to Oaxaca and France over and over again. I like the sand bottomed waves, the food, and the cultural experiences that both places offer. I’ve also never seen a shark at a French beachbreak or Mexican pointbreak. In 2018, I spent a week with my wife in Oaxaca in May and two weeks with her family in Japan in September. We snuck in a quick three-day trip to an island south of Tokyo and were blown away by rivermouth waves and near-tropical surroundings. Can’t wait to go back in October. I also got to spend five days at my favorite place in the world, Hossegor, France, on the way to a job in Greece. I live in Los Angeles and the waves usually aren’t always so hot here, so I spend a lot of time and money driving around Southern California looking for better options. My parents live in San Diego, and the waves are usually better there than in L.A. in the winter, so I head south pretty often. Driving at night is much easier for traffic, but when I drive to San Diego in the summer, I often stop at Trestles or Oceanside on the way there or back. The waves were really good everywhere in December of 2018, and I found myself with time on my hands so I made some fun local trips to Rincon and Ensenada, Mexico. I decided to take a harder look at the actual cost for me to be a surfer in 2018, and, apparently, it cost me about $6,000. Here’s a breakdown of my 2018 surfing expenses. $1,000 gas for eight trips to Trestles/San Diego, four trips to Rincon, five trips to Huntington, one trip to Ensenada and 50 or so trips to local spots in L.A.
* I convinced the team at The Inertia to pony up some cash on each of these trips to do features for The Inertia, which offset the costs. Thanks, fellas! Surfing is my favorite thing to do, and I’ve always valued experiences over things so it doesn’t bother me to spend around $6,000 per year total on it. It’s nice to realize, though, that, in reality, I was able to offset a good chunk of those costs through content creation. It took me a year to spend the equivalent of a single heli-day snowboarding or a three-day trip to Tavarua. I’ve had years where I was gone for six months and spent $20,000 – $30,000 on travel, but I’ve always found a way to offset a meaningful part of it through work. In terms of equipment, I only bought a wetsuit for myself in 2018, but I’ve already gotten two new boards this year. I just got an electric car so my fuel costs will go down for local surf trips. The bigger change for this 2019 is that I started working full time as a producer at Spectrum. I haven’t been surfing as much as I would like lately, and I’m jonesing to go on a few three- to five-day surgical strike trips after I settle into the job. So my 2019 spend for surfing will probably be higher than 2018, and I doubt I’ll be offsetting it through as much freelance work on the road. But hopefully, the extra money will go towards getting better and more uncrowded waves. Surfing is becoming more and more the province of rich people, but I feel like I’ve found a way to get good waves in a wide variety of places while minimizing my costs. Editor’s Note: Interested in taking a harder look at your surf, snow, or outdoor expenses? We plan to continue examining the true cost of stoke this year, so shoot us a note at contribute@theinertia.com with any breakdowns of your expenses or cost-cutting tips. The more we share with each other, the thicker our wallets, and the more resources we have available for gettin’ out there!